We all dream of striking it rich, that one lucky minute that changes our lives forever. But for Terry Herbert, an unemployed man from Staffordshire the dream has become a reality. Using his 14 year old metal detector on a friend's freshly ploughed field in Staffordshire, he stumbled across the largest single find of Anglo-Saxon gold in history. 'I dreamed of gold night after night until I handed it in' said Herbert yesterday when the find was revealed to the world. Since July when the discovery was made there has been some question as to the ownership of the hoard. The laws governing 'Treasure Trove' can be complicated to interpret in themselves. They are based on several principles founded on Roman law. The 'Treasure Trove' law written in Edward the Confessor's time remains almost intact to this day. There are three main deciding factors if something is subject to 'Treasure Trove' and therefore property of the crown. 1) if it can be proved that there was an intention to recover it later. 2) No person living can prove ownership either themselves or their descendants. 3) If treasure is hidden it belongs to the crown unless someone else can lay better claim to it. From the early 1900's the treasury has paid the finders/landowners the full antiquarian value of pieces they keep (they have declared this treasure trove). While I personally would have nightmares putting a value on the Staffordshire hoard, there is no doubt that Mr Herbert and his friendly farmer are looking at a substantial sum. The 5kg of gold and 2.5kg of silver are mainly comprised of armaments and ornamental objects. Decorative sword hilts, bosses, pommel caps and helmets are some of the types of articles they have discovered. There are no feminine pieces such as necklaces, bracelets or rings. Unlike the discovery in 1939 of 'Sutton Hoo' which was a burial mound of a Saxon king, there is no context for this discovery. Mercia would have been one of the richest kingdoms in Britain in the 7th century, so it seems likely that it was a hastily stashed hoard from a raiding party. There are perfect examples of shield bosses with chequered 'millefiori' inserts and garnet 'cellwork' ornamentation. Densely interwoven helmet pieces, and intricately carved sword hilts. 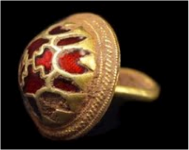 Many of the items are similar in style to Babylonian work of this age, suggesting that even in the Dark Ages we were importing jewelled items to our shores. Although 1345 pieces have been examined so far, there are 56 pieces still remaining in clods of earth. This find will take years to document and understand. One thing is for sure, it will greatly change all we know about the ancient goldsmith's art and the stones they used. In the meantime, Terry Herbert is already dreaming about his next treasure.